Lamprey type II collagen and Sox9 reveal an ancient origin of the vertebrate collagenous skeleton. 2006. GuangJun Zhang et al. Proceedings of the National Academy of Sciences. Published on-line. 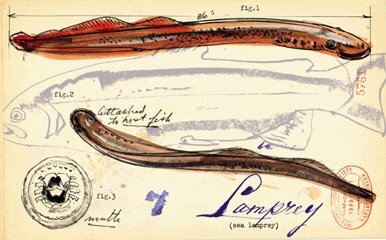 Lampreys, long thought to have taken a different evolutionary road than almost all other backboned animals, are not so different after all, especially in terms of the genetics that govern their skeletal development. UF scientists found the same essential protein that builds cartilage in this odd animal is collagen, the same structural molecule that is found in all vertebrates with backbones and jaws. "It was thought collagen was a relatively recent invention in vertebrate evolution that unites us with reptiles, amphibians, sharks and bony fishes, while the lamprey skeleton was based on quite different proteins," said Martin Cohn, an associate professor with UF. "Knowing that lampreys also use collagen to build their skeletons makes sense. 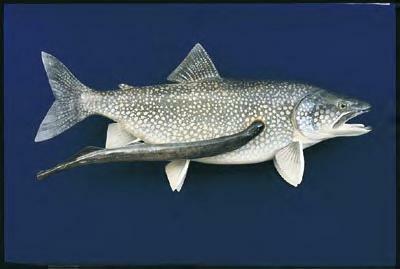 Lampreys and jawed vertebrates inherited the same genetic program for skeletal development from our common ancestor." The results indicate the collagen-based skeleton evolved before the jawed and jawless vertebrates split into different paths, not afterward. "One of the classic characters in the scientific literature for the past 100 years that has been argued to link all vertebrates, to the exclusion of lampreys and hagfishes, is bone, pure and simple," Michael Caldwell (U of Alberta) said. “An entire taxonomy was created for animals that basically have a head at one end and cartilage to hold it together, but no bone. But this work says the common feature of vertebrates is not the presence or absence of bone, but the presence of a shared gene system that produces cartilage. This conclusion is illuminating and extremely important."